May can be one of the prettiest months of the year. The sun is shining, flowers are blooming, and the grass has emerged from its winter hibernation as a bright springy green. All of a sudden, you feel more energetic and a yearning to get outside and get some exercise in the fresh air. Unfortunately, many of the things to love about this time of year – the flowers, green grass, warm weather, exercising outside – can actually trigger the serious and sometimes life-threatening disease of asthma. 22 million Americans and causes close to two million emergency room visits each year. May is Asthma Awareness month – the perfect time to learn more about the symptoms and causes of this disease. In people with asthma, allergy-triggering substances cause the bands of muscle in the body’s airways to tighten. As the airways narrow and swell, they produce extra mucus, which makes breathing difficult. As less air is able to move through the airways, the individual can feel short of breath, which often makes them start wheezing. People with asthma have extremely sensitive airways, which make allergens and irritants that much easier to cause an asthma attack. or air pollution. Allergic reactions to foods, certain medications, cold air and physical activity can also bring on an asthma attack. One of the scary truths about asthma is that anyone can develop the disease at any time. If you suffer from asthma as a child, you can outgrow it, and if you have never had asthma, you still run the risk of developing it as an adult. “It isn’t clear why some people get asthma and others don’t, but it’s probably due to a combination of environmental and genetic factors,” Dr. Fitru says. About half of adults who experience adult-onset asthma also have allergies. Many of the other cases are caused by work environments, also called occupational asthma, which is increased exposure to smoke, perfume or other workplace materials. People who are more likely to develop adult-onset asthma include individuals with allergies, those exposed to a high amount of environmental irritants, those recovering from viruses and illnesses, and women experiencing hormonal changes. “Because asthma changes over time, you’ll need to work with your doctor to track signs and symptoms, and adjust treatment as needed,” Dr. Fitru says. program coordinator at Dawn Career Institute. Long-term control medications include corticosteroids, bronchodilators, leukotriene receptor antagonists, cromolyn and immunomodulators. Anti-inflammatory drugs such as corticosteroids are important because they prevent asthma attacks on an ongoing basis. Bronchodilators relieve asthma symptoms by relaxing the muscles around the airways. They also help clear mucus from the lungs. Hall recommends visiting your doctor as soon as you experience any asthma or allergy symptoms to see which medication you might need. Although your first step to combat asthma should be prescription medicine, Dr. Fitru says there are several lifestyle changes you can make on your own to prevent asthma attacks. Changes you can make in your home include cleaning regularly, reducing pet dander, changing the filters in your furnace and air conditioner, and replacing carpet, pillows, mattresses and curtains often. research shows that people who are overweight are at a higher risk of developing asthma. Also, control any heartburn or acid reflux problems that can worsen asthma symptoms. It is important to understand the environmental triggers for asthma and allergies that abound this time of year. Asthma Awareness Month gives you the opportunity to protect yourself and loved ones – and gives you the knowledge to safely stop and smell the roses. If you are interested in a career as a medical assistant, nurse assistant or pharmacy technician, Dawn Career Institute may have the right program for you! 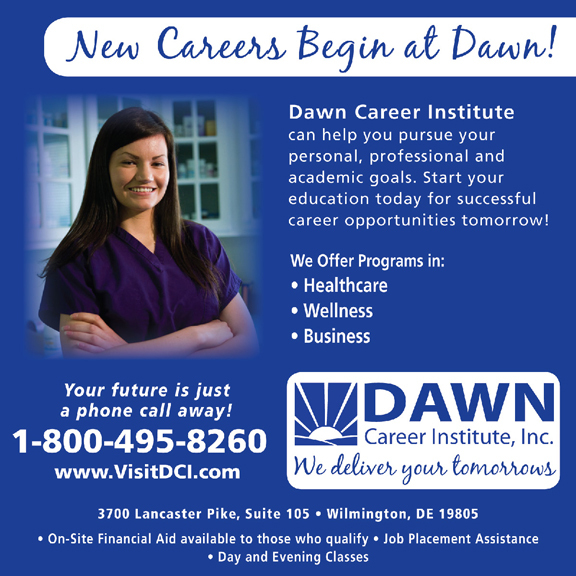 Dawn Career Institute offers day and evening classes at its campus in Wilmington, Del., and online. In programs that last about eight months, you will learn the essentials to qualify for a job in one of these fast-growing professions. Dawn Career Institute offers job placement assistance to all its students, and financial aid is available to those who qualify. Dawn Career Institute also offers the following career-training programs: Dental Assistant, Esthetician (Skin Care Specialist), Legal Assistant, Massage Therapist, Medical Administrative Specialist, Medical and Dental Biller/Health Insurance Claims Examiner, and Personal Fitness Trainer. Dawn Career Institute is accredited by the Accrediting Commission of Career Schools and Colleges (ACCSC).